A classic name in SUVs is coming back. 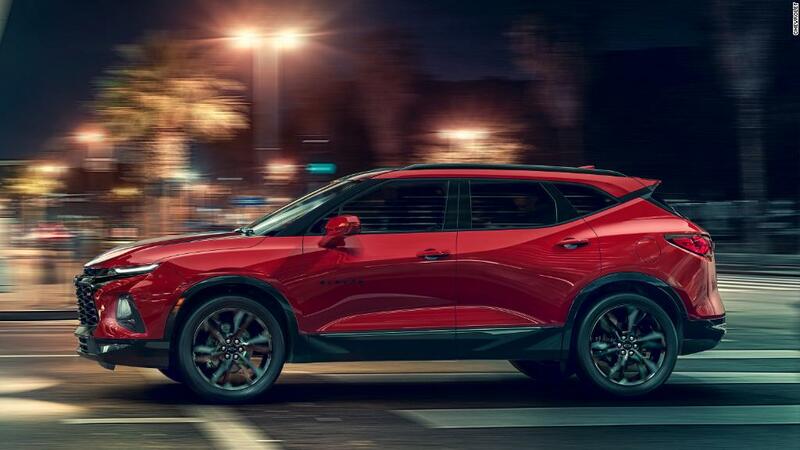 An all-new Chevrolet Blazer that will go on sale next year was unveiled at an event in Atlanta on Thursday. General Motors (GM), Chevrolet's parent company, hasn't made a Blazer since 2005. But the world has gone mad for SUVs, so an automaker like GM needs to offer one of every imaginable size. 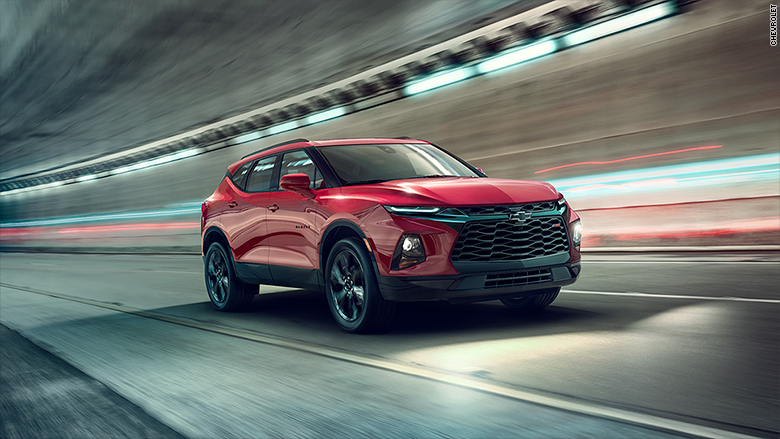 This new Blazer is designed to be a little bigger and roomier than the compact Chevrolet Equinox but smaller than the big Traverse crossover SUV with its three rows of seats. It's not just about size, though, said Michael Simcoe, GM's global head of design. The new Blazer also has a sportier character than Chevrolet's other SUVs. The Chevrolet designer team didn't try to make it look like the old Blazers, he said, but they did want it to reflect their youthful appeal. 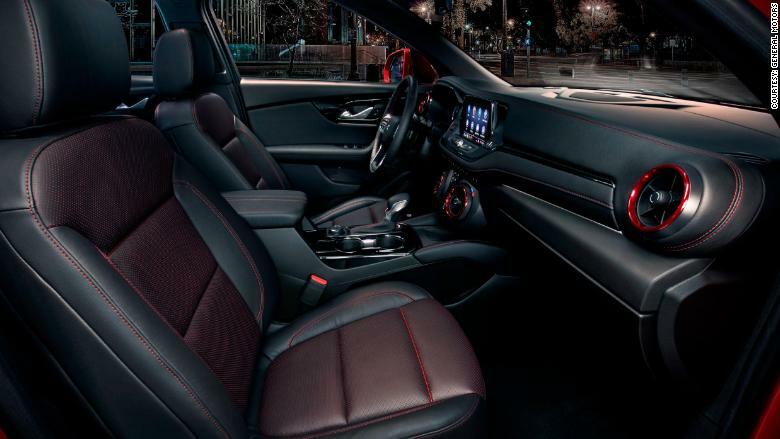 The interior of the Chevrolet Blazer carries the sporty style of the exterior. The new Blazer can seat up to five people and will be offered with a choice of 4-cylinder or V6 engines. The back seats will slide backward or forward 5.5 inches to create more cargo room or more legroom, depending on needs. With the biggest V6 engine, it will be able to tow 4,500 pounds. GM will make the SUV in Ramos, Mexico, and it will be available in a number of versions, including the luxury-trimmed Blazer Premier and sporty-looking Blazer RS. Pricing and fuel economy information will be available closer to when the Blazer goes on sale early next year. The Chevrolet Blazer RS will have a more aggressive look than some of Chevy's other SUVs. The original Blazer, called the K5 Blazer, went on sale in 1969. It was a burly all-wheel-drive vehicle built on the chassis of a full-size Chevy pickup. Made to compete against vehicles like the Ford Bronco and International Harvester Scout, it was, essentially, an off-road truck for carrying people. You might be more familiar with the much smaller S-10 Blazer that came out in 1983. It was also built on the chassis of a pickup, but this time on the compact S-10 truck. For years, GM sold both Blazers so customers could pick the size that suited their needs. Eventually, though, the bigger Blazer was replaced by the Tahoe. The smaller one was discontinued in 2005 and essentially replaced by the Chevrolet Equinox crossover SUV. The Blazer isn't the only classic SUV making a return. Ford will also re-introduce the Bronco in 2020. Sharing its engineering with the Ford Ranger pickup, the new Bronco will be intended for more serious off-road use than the Blazer.